Bees are obviously associated with honey but consumers are generally unaware of how crucial bees are to human food production. It is estimated that one third of our plant products depends on the bee pollination. Honeybees and the wild honeybee population are also vitally important in the conservation of floral reserves and in terms of biodiversity. As has been seen globally, bees are placed under immense stress due to commercial farming practices, pesticides, monoculture crops and the list continues. Thousands of American beekeepers have also reported losing about 42 percent of their colonies in the past year. The second American Foulbrood (AFB) outbreak in the Western Cape area, the first was in 2009, needs to serve as a wake-up call for the bee industry in South Africa and the manner in which bees are farmed, particularly since the primary role of most honeybees is for commercial pollination. South African wild bee colonies are more disease resistant than managed colonies. Support for a bee conservation effort, to safeguard the wild bees is crucial for the protection of the gene pool and future pollinators. It is therefore of great concern that the emergence and growing popularity of Bee Kind has been heralded as a bee sanctuary and a solution for safeguarding our bee population. Grass advocates for informed consumer choice and since consumers are purchasing the Bee Kind honey with the understanding that they are helping to save the bees I have written a second letter to Bee Kind highlighting these concerns. Consumer awareness about our bee colonies and their desperate situation certainly needs to be raised. The information and campaigns need to be accurate and the solutions real. Additional damage to an already precarious situation may just push South Africa’s bee population to where the U.S. and China now find themselves – in a hopeless situation. I ask again, why have you chosen to use the term ‘sanctuary’ because this is not a sanctuary but a bee farm? The use of the word sanctuary in its common law sense (as a haven or shelter) See Ex parte Fichardt 1946 OPD 356 where sanctuary was defined as a sacred place, shelter, refuge or haven. You can therefore see clearly from the above quotes that Bee Kind could not be referred to as a sanctuary and this term is misleading to the people that are purchasing your honey and hives with the understanding that Bee Kind is something other than a bee farm, which it is not. In the interest of transparency and preventing misleading claims, Bee Kind needs to address this concern by notifying the supporters that Bee Kind is not a sanctuary and to remove all reference to Bee Kind as a sanctuary. Do you agree that concerned consumers would read these statements and mistakenly believe that your composite hives are the answer to AFB outbreaks in South Africa? Which hives were inspected on the site as you have said that you re-hived 200 hives? 3) Existing 200 hives – where do these come from? In my previous letter I asked you about the 200 hives that were re-hived and who they belonged to. I would really like an answer to this question as you only said “These bees are here already”. Where do these bees come from? Bee Kind also claims that the Gouritzmond area, where the bee farm is located, is a non-agricultural area but it is a sheep and canola farming area. It also already has bee farmers, many of which are involved with the pollination services industry. Which means many of the hives in this area move around the Western Cape during spring and then return to Gouritzmond post pollination. Do you know if these beekeepers are all registered members of any bee association and if they properly adhere to pollination management practices? Are you fully confident that there won’t be any AFB contamination from these bees? It is also my understanding that since your aim is to re-populate the hives of bee farmers that have lost their colonies to AFB and other diseases that this operation is not about ‘saving SA’s dying bees’ but instead would seem to be a factory farm producing bees that possibly could be the next victims of AFB once handed over to bee farmers of known infected farms. So this in no way addressing the concerns about the bees, it is merely ensuring a supply of more bees for bee farmers. You didn’t respond to this question in my previous letter. Are these guidelines available for consumers to view? Do you have any concerns about moving honey or bees out of or around the Cape region? I would like to know your method of badger control, as looking at the pictures of your stands, they don’t look firmly placed enough to prevent badger damage? 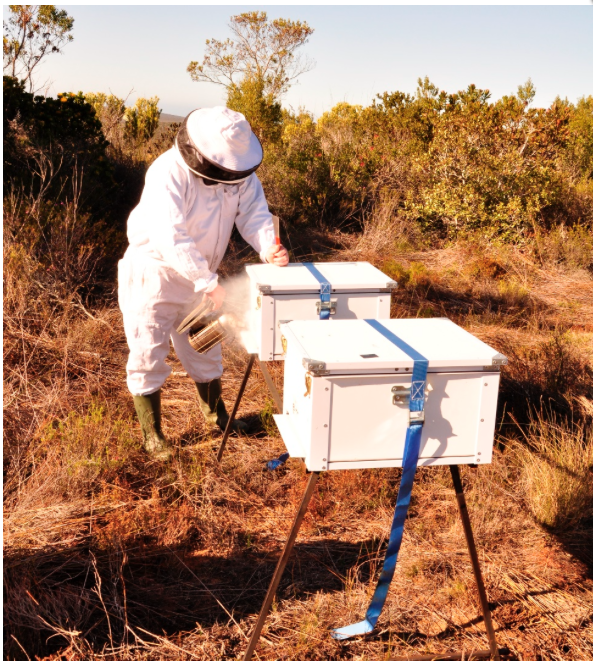 There may be some definite ‘advantages’ for bee farmers to using these hives compared to untreated soft SA pine that might suffer from dry-rot, etc. but many farmers that use wood, for various reasons, claim that they have never had sacbrood, chalkbrood or many of the other pests or diseases because they have healthy bee colonies with strong immune systems and defences. The question really is, are these composite hives, made of synthetic, possibly estrogenic activity (EA) disruptive plastics1, advantageous for the bees? Bees are up against so many toxic variables, does their ‘home’ need to be another one? Bees also don’t’ really like plastic, ask any organic bee keeper. So are the Bee Kind composite hives really the answer to bee health then? You mention sterilizing the hive if needed. How is this achieved and what chemicals would be used? Below is an extract from IFOAM Organic Bee Keeping Standards in which you will note that there are many other reasons that Bee Kind honey could not be certified organic, in particular that your composite hives are not made of natural materials and that they contain polystyrene. In the interest of transparency and misleading references to the term organic, Bee Kind needs to address this concern by removing all reference to organic in all marketing materials and online sites. 9.1 The areas within a 3 km radius of the hives shall consist of organically managed fields, uncultivated land and/or wild natural areas in a way that ensures access to sources of honeydew, nectar and pollen that meets organic crop production requirements sufficient to supply all of the bees’ nutritional needs. 9.2 The operator shall not place hives within a foraging distance (5 kms) of fields or other areas with a high contamination risk (e.g. conventional fields, industrial zones and highways). 9.3 The hives shall consist primarily of natural materials and present no risk of contamination to the environment or the bee products. Use of construction materials with potentially toxic effects is prohibited. 9.4 At the end of the production season, hives shall be left with reserves of honey and pollen sufficient for the colony to survive the dormancy period. Any supplementary feeding in response to unexpected need shall be carried out only between the last honey harvest and the start of the next nectar or honeydew flow period. In such cases, organic honey or organic sugar shall be used. 9.5 Bee colonies may be converted to organic production. Introduced bees shall come from organic production units when available. Bee products may be sold as organically produced when the requirements of this standard have been complied with for at least one year. 9.6 During the conversion period, the wax shall be replaced by organically produced wax, except where no prohibited products have been previously used in the hive and where is no risk of contamination of wax. In cases where all the wax cannot be replaced during a one-year period, the conversion period shall be extended to cover the full replacement of the wax. If you could please respond to these queries under each question and not copy and paste that would be appreciated. South African Bee Industry Organisation (SABIO) website has information on the biology of our native bees. Do you want to support this kind of commercial beekeeping? This is the question one needs to ask as a crowd-funder of this project. BeeKind is in essence, no different to any other commercial bee-breeding operation. However, the biggest difference is that the supporters of the BeeKind project are funding these bees (splits) that are given free of charge to commercial bee operations only to be killed by AFB once again and replaced with healthy ones. Again funded by cheap honey (what the supporters get). This is obscene! And this cycle continues. To quote Mr Aberdeen, „there is no cure“ and „every commercial beekeeping operation has it“. So this cycle ensures Mr Aberdeen’s business success long term. Commercial bee-breeding is not a solution to the welfare of our bees and the AFB crisis. Commercial farming resulted in AFB in South Africa in the first place. Tackling the issue from the same platform (offering a commercial farming solution), will NEVER ensure that our bees are safe. The crisis, if anything, will get worse. South Africa and South Africans have the responsibility to deal with this crisis across platforms so that we can find an appropriate solution. Our commercial bee-farming practices need to change. I am pleased to see that Mr Greg Aberdeen has realised that in the interest of not misleading consumers and supporters of the Bee Kind project that he has begun stating the facts. I do not believe that he set out to intentionally mislead people but that in his enthusiasm he began to make inaccurate claims that were not well considered. I congratulate him for taking the steps to rectify the situation. Well done. I would like to make it clear that at no time did I call the Bee Kind farming project a scam, I asked Mr Greg Aberdeen to remove misleading statements in regards to calling the farm a sanctuary and the reference to organic. I do hope that he has made it clear that his farm is not a sanctuary and does not provide organic honey on all marketing marketing and online presence too. I would also like to encourage Mr Greg Aberdeen to make his rules and guidelines that he speaks of available for public viewing in the interest of transparency. September is Bee month – lets get together and look at these issues, I am also keen to visit some more bee farms and speak to the farmers to see what they have to say about pragmatic solutions to a very concerning situation. I don’t want to see our bees having to be replaced by humans with paintbrushes like they have to do in China. Well said, Bee Wise. A small victory for ethical bee keepers and bees. I would like consumers to be protected in South Africa from misleading claims. I would like to see a strong, informed and vocal consumer voice in South Africa. I would like to see greenwashing and healthwashing, which is rampant in South Africa, exposed for what it is. I would like to see consumers educated to enable them to make an informed choice. I would like to see living creatures valued above their monetary value and what they can provide for humans. I would like to see the end to the misuse of the terms free range, grass fed, ethical and organic. I would like to see our government have goal to protect our soil, bees and water. I believe in the wisdom of our traditional farmers. I believe in the people that are working with humility for a better food system in South Africa. I am passionate about supporting smallholder and emerging farmers. I believe that factory farms, including bee factory farms are abhorrent. I believe in nutritional food sovereignty for all. I have realized over the four years working as a food and consumer activist that it’s not about reality but perception. Many consumers are not well informed enough to know what questions to ask and believe the marketing hype instead. There is power in words and who owns those words. My focus is on the right of the consumer to make an informed choice. Bee Kind has become a runaway train and unsuspecting consumers are continuing to believe that they are saving South Africa’s bees by supporting this Bee Kind ‘Sanctuary’. The only manner to address these concerns was through an open letter to Mr Aberdeen as he avoided answering certain questions and did not supply a satisfactory answer to his reference to “organic” nor to using the term “sanctuary”. Mr Aberdeen may be playing the victim now but there’s a different story beneath the layers. I would like to remind Mr Aberdeen that he has yet to answer the questions I posed in the open letter to Bee Kind. I would also appreciate that he post my first letter in its entirety and not just cut and paste out of context. Below is an extract of a letter I received this morning from Mr Aberdeen. What became clear to me is that words seem to run away with Mr Aberdeen. First he states that his business is under attack and then he states that he is a non-profit (Section 21) company. I am not sure what the relevance is of a Section 21 company in asking Mr Aberdeen to stop using the term sanctuary and refrain from reference to organic. From my understanding to register as Section 21 company and receive tax emption status, a company needs to operate with the purpose to help people or the environment, etc. The profit is called a surplus and tax is not paid on this surplus. The company must show that it benefits society, is this where ‘saving the bees’ comes into play to enable Bee Kind to be registered as a Sect 21 company? I have also been accused of being the voice behind “BeeWise” comments on Travelwrite, I do not hide behind any other name and I never have and never will. As a food and consumer activist, if I have something to say then I do so with transparency. Once again, you have a play on my words. Here is the original mail. Where do I state we are a section 21 ? Thank you for your article, it has lots of people talking. I do however have a few questions. You start off with “Greetings again Mr. Aberdeen”. Other than your email to me, what are you referring to? A different post on the subject? You call it “An open letter to Bee Kind” yet we were highlighted to your article and have no record of you ever informing us of this post. Not once have you ever seen our hives, asked for references or contact details of beekeepers who have bought hives from us, to get their view on them. Claim they are toxic plastic. This is something that has been forwarded onto Best Beehives Attorney to handle, as it is a blatant attack on a business. Did you ever ask if Bee Kind is a Section 21? You really did not do your so called homework and this stinks of Ujubee, in my opinion. I’m flabbergasted. First Mr Aberdeen gives you a direct invitation to ask questions for the purpose of transparency (‘Thank you for your mail and please feel free to ask as many questions as you like. Transparency is what we are all about.’), when you do in an open letter he threatens you with a lawsuit (‘This is something that has been forwarded onto Best Beehives Attorney to handle, as it is a blatant attack on a business’). As I see it, Mr Aberdeen’s commitment to transparency enables dialogue around fraught questions which you raise in your initial set of questions to Mr Aberdeen, as also related/follow-up questions in your open letter regarding, for instance, terminology and marketing (‘sanctuary’), how best to combat AFB, and natural versus synthetic/composite hives. A lawsuit cancels all of this. I only skimmed through the post, because face it, it’s long! But just YES. Great article Sonia! Thank you for asking the difficult questions. Such a common theme with conventional bee keeping operations. Cry about how their bees are dying and how we as the public need to “save” them. We think we are saving the bees, when in fact we are saving their farm. Conventional beekeepers are the the problem. 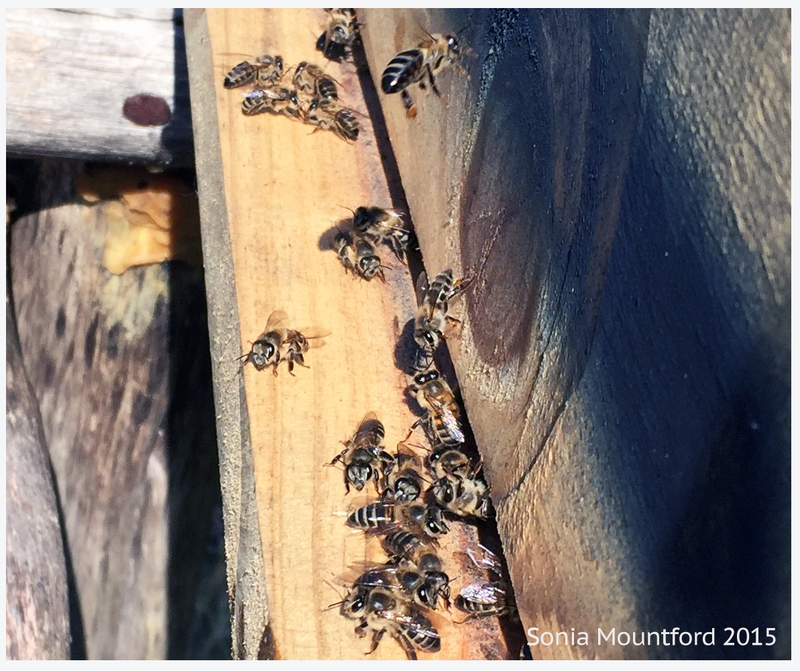 Please look into biodynamic bee keeping and learn what a real bee sanctuary is. Quit acting as if you / we have another planet to move too once the 6th mass extinction is over. This is the first I hear of this other than an email you sent me on 12 August and the manipulation of my words is to do what? Here I post the full email and not a word has been changed. Also, you never asked about badgers. questions as you like. Transparency is what we are all about. Please find answers to you questions below. honey. We, as beekeepers, may not label our honey as “Organic Honey”. around the hive as bees will easily travel that distance in search of forage. free as we a near no agricultural operations. reaches a stage of disorder, implying the risk of colony collapse. apiaries, diseases are spread by swarms or by beekeeper’s interventions. The composite hive has many advantages over wooden hives. longevity of the hive, buy ultimately it will return to a hydrophilic state. will be free from these threats. and top ventilation prevents this from happening. degrade and therefore will outlast wood with a 40 to 50 year lifespan. Polystyrene is used as a thermally encapsulated barrier within the hive. Cape Bee Industry Association. We were cleared of AFB. commercial beekeepers? I am just wondering why you chose the term ‘sanctuary’? guidelines as set out by our group. Are these guidelines available for consumers to view? practices, thus creating much needed rural jobs. around or off the sanctuary. also state that you will never move the hives? here are points to look at. split is to get a feel for the strength and health of your established hive. will swarm in a matter of days if not hours. collection. The composite hive, with the half colony stay with us. spread of AFB? See below for more on this question please. honey is easily and cheaply detectable. We will batch test our honey. Bee Kind farms healthy bees for commercial beekeepers. will be supplying commercial beekeepers are not infected with AFB? doing what all beekeepers are doing, inspect your colonies. is the manner in which you harvest your honey and when will you be harvesting? What type of extruder equipment do you use? Where is this honey being processed? you for this email as we will use it as our FAQ in its entirety. questions as FAQ on your website yet. I will go through as soon as I can. Sir, inter alia, housing bees in plastic containers is not being kind to bees (or the environment/earth/planet for that matter). Therefore, your Bee Kind Project constitutes false labelling or advertising, which, as I understand it, is the point that Grass is bringing to your and our attention. Dear Grass on behalf of the bees, nature (including us humans), and our suffering precarious planet thank you for nailing these guys. Putting something like this together must absorb huge amounts of time, persistence, and energy. Your care, your integrity and your love for animals, insects, birds and the soil is humbling and inspirational. She did no research, she asked me a few questions via an email, edited it to tell an untruth and posted it. Mr Aberdeen, I disagree. Ms Mountford’s questions – coming from a particular, articulated and principled position (see her ‘… here is my agenda’ post, September 1, 2015: 10:05, and the stated purpose of the Grass Consumer Food Action blog) – are specific and searching. She has studied your replies carefully within the context of her research and either problematized them, for instance your contention that you are offering bees a sanctuary (she refers you to legislation), and the possible toxicity of the materials you are using for your synthetic hives (she points you to a research paper), or she has asked you for further clarification.